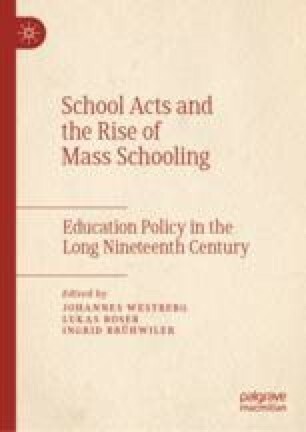 This concluding chapter aims to highlight the potentials of a school history that deliberately focuses on school acts or related legal norms in the long nineteenth century, by first depicting its traditional and—from today’s point of view—problematic form, and thereafter analyzing the fate of this kind of traditional historiography against the background of the two historiographical types mentioned above, new cultural and neo-institutional historiography. The fourth section reflects upon what we can expect when dealing with legislation in the context of the nineteenth century, with the emergence of the nation-states and their embeddedness in cultural traditions and idiosyncrasies that affect both constitutions and legislation. The final section deals with the danger of national epistemologies in writing national histories of legislation, which often make scholars blind toward both their epistemological point of departure in framing their research and the intensive transnational flows of ideas and concepts that were translated and nationally adapted in such a way that later on their multiple origins are as difficult to recognize as are the national epistemologies.